On October 30th 2013 the Boston Red Sox defeated the St Louis Cardinals in six games to win their first World Series at home in 95 years. At the same time, the Alex Rodriguez arbitration meetings have begun. The two events represent the good and bad sides of baseball respectively. However, there have been people lately (cough cough Mike Francessa cough cough) claiming that Rodriguez and World Series MVP and Boston Hero David Ortiz are one in the same. These comparisons are asinine in a multitude of ways. Before showing the differences between the two, lets see the similarities. Rodriguez and Ortiz both showed up in the formerly confidential 2003 steroid report. Now that were done were the single comparison between the two, lets look at the differences. Firstly, there approaches to the accusations were different. Ortiz vehemently denied any steroid use. Rodriguez, while initially denying it, did admit to taking steroids. 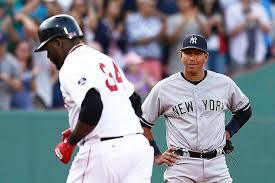 In our society it would seem like A-Rod would get bonus points for this, while Ortiz would be shunned. This would have been the case if it were not for something called Biogensis. After connection was established between A-Rod and the PED clinic, his credibility, likability, and credibility were all destroyed. Meanwhile, Ortiz it was never proven to have taking steroids and has never had any accusations against him since. The differences don’t stop there. Ortiz has been a local hero in Boston. Nicknamed “Big Papi” Ortiz has shown up constantly and consistently in the playoffs. From hitting two walkoff homeruns in games 4 & 5, to being crowned MVP of the 2013 World Series, Ortiz has shown his value early and often. Rodriguez on the other hand hasn’t. In fact, he has done quite the opposite. A-Rod opted out of his already monstrous contract very early into the deal, in order to make even more money. This polarized many fans. In addition, his on field play hasn’t helped. In the playoffs, Rodriguez has hit only .263 in 11 playoff series. These are not the numbers of a $250 million player. In conclusion, Rodriguez is stuck in a catch 22 that is symbolic of the entire steroid era. He could have saved his name had he been clean, but would he have been any good if he were clean. To be fair, Ortiz has had a bit of a bias towards him due to his postseason heroics, but is that valid? If a player proves to be clutch and never tests positive again, should he be forgiven? The unfortunate thing is that’s what this era has become. We question everyone and don’t like to believe anyone. There has been a dark cloud created by steroids and it doesn’t seem to be lifting anytime soon.